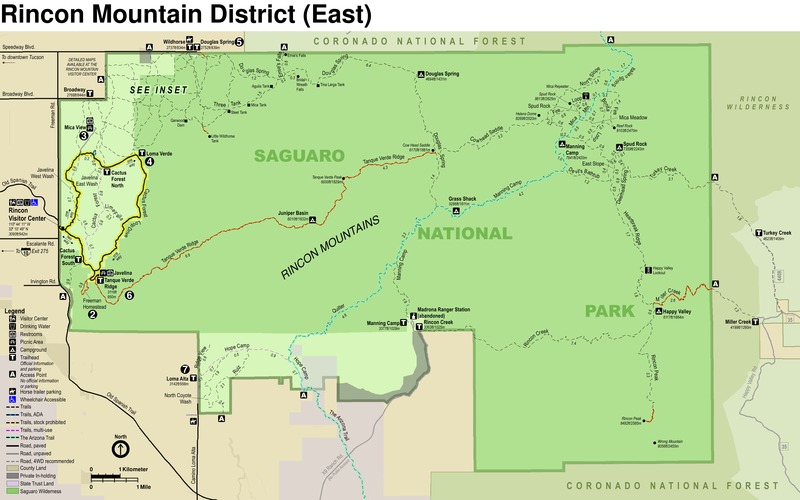 Introduction: The Rincon Mountains are a tough, rugged range, and the trails are even tougher. Most of the trails in the Park go straight up and straight down. The exception to this rule is the Cactus Forest Complex. The Cactus Forest is a complicated maze of trails around the base of the Western Rincons. This network of trails can be linked up in numerous ways to create easy to difficult, short to all-day hikes. The following hike threads its way through the Cactus Forest to the most interesting destination in the Rincon foothills: Wild Horse Canyon. 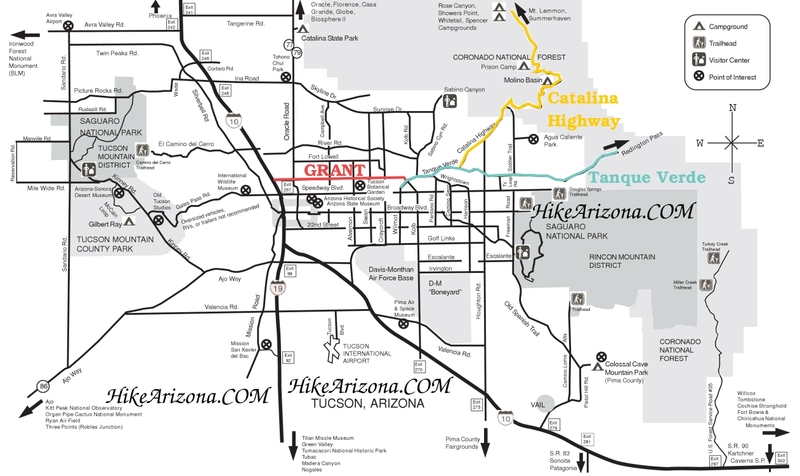 Hike Summary: From the trailhead, find the Shantz trail and follow it as it roughly parallels Broadway Road. 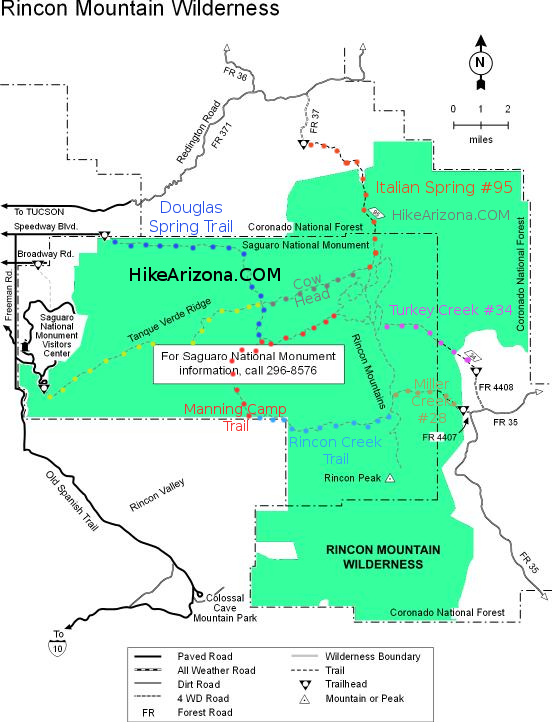 Once you reach the junction with the Pink Hill trail, turn right onto this trail towards the Rincon Mountains. This trail strikes out across the desert, gaining and losing elevation imperceptibly as it crosses small ridges and washes. The scenery is classic Sonoran Desert, and the saguaros are striking. Many of them have well over half a dozen arms. 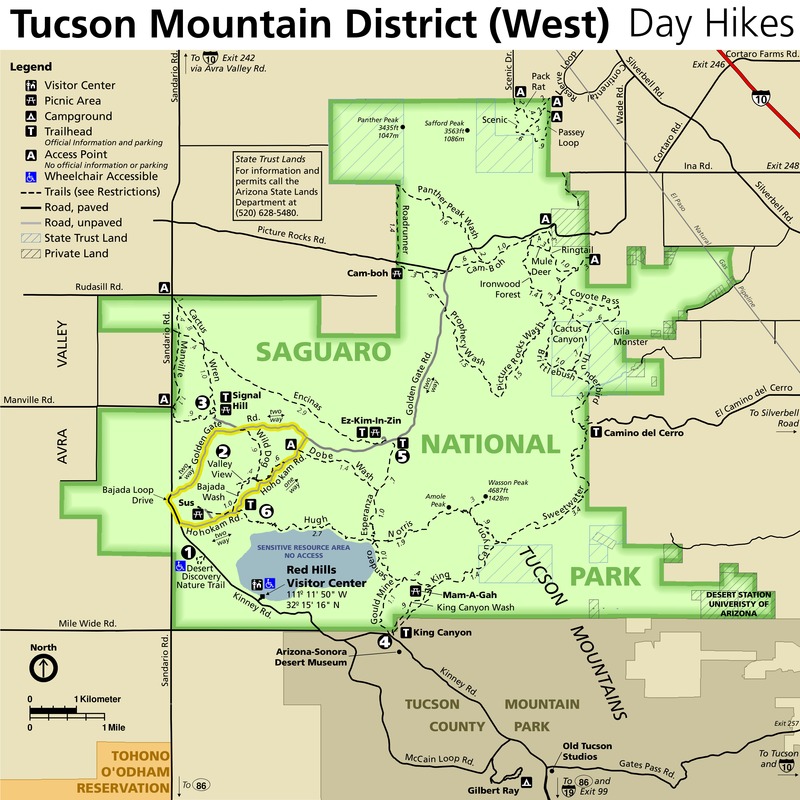 Shortly after passing a junction with the Loma Verde trail, the Pink Hill trail climbs over Pink Hill, which has a bald top offering great views of the Tucson Valley, the Catalinas, and the Rincons. Shortly after coming off of the Pink Hill, you reach a junction with the Squeeze Pen trail. Turn right onto the Squeeze Pen trail and follow it for .2 miles to the junction with the Carrillo trail. Turn left onto this trail, which quickly drops into the wash of Wild Horse canyon. This is where the hike gets more interesting. After following the wash for a few hundred feet, the Carrillo trail climbs onto the rim of the wash and follows it up into the foothills of the Rincons. 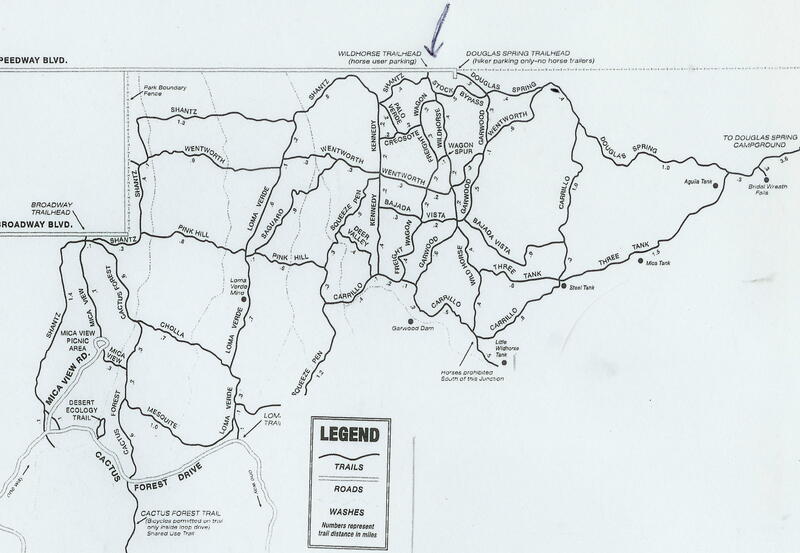 You will pass four junctions with trails, and at all of them you will want to bear right, staying on the Carrillo trail. Eventually the trail will bring you to the Garwood Dam. This Dam was constructed in the 1920's by a local rancher named Garwood, and is still in good shape today. There are some interesting areas to explore up and downstream, but be cautious if you decide to walk across the dam. It is a hair-raising experience. From the dam, the Carrillo trail climbs up onto a ridge above Wild Horse Canyon. This is the only substantial steep climb of this hike. The trail follows this ridgeline towards the Rincons, offering great views. It drops down to meet a junction with the Wild Horse trail. You will want to turn right here, and head between two fence posts. This trail drops into Wild Horse Canyon. This is a very pretty section of canyon, with tall reeds, nearly permanent pools of water, and slick granite waterfalls. I recommend taking a lunch break here, and allowing some time to explore both up and downstream. To finish up the hike, head back out through the two fence posts to the junction of the Wild Horse trail and the Carrillo trail. Head north on the Wild Horse trail, which winds around the Rincon foothills. It soons begins to parallel a canyon, which Leavengood refers to as the "Black Hole" in her book Tucson Hiking Guide. Dropping down to level ground again, the trail reaches a confusing junction. Follow the signs which say "Wentworth Trail W .2" After .2 miles, turn right onto the Wentworth trail. This trail will take you across an old airstrip overgrown with prickly pear and creosote. The trail then crosses a wash and heads through an area of thick mesquite. Upon reaching the junction with the Loma Verde trail, turn left onto this trail. After .8 miles, this trail connects with the Pink Hill trail, where you can retrace your steps to your car. This hike exceeded my expectations. I expected merely a pleasant ramble across flat desert, but these trails take you through varied terrain and explore some interesting pockets of pristine wilderness. A very good weekend hike. From anywhere in Tucson take Broadway Boulevard east almost to its terminus just before N. Camino Del Codorniz. It's 14.6mi from I-10 straight through on Broadway.